tyaktva deham punarjanma naiti mameti sorjuna. Mam eti = ( But ) attain ( unite with / dissolve unto) me. ( He becomes God himself, Jeevatma and Paramatma supreme union ). Now practically we have an uncertain, limited life , yes it is true, but, sometimes, when we involved in un-selfish , pure and holy thoughts ( for short moments ), then this same life itself obtain a Divine nature, yes we feel this on certain occasions. Sakaropasanam is like Nirakaropasanam only; this slokam points this for development in spirituality. There are few vedantins who do not aware of (dislike/ hate) Avatarasangalpams. They are barking on shadows. Upasana whether it is Sagunam or Nirgunam, if the Upasaka is honest and sincere, leads him to Supreme Truth. 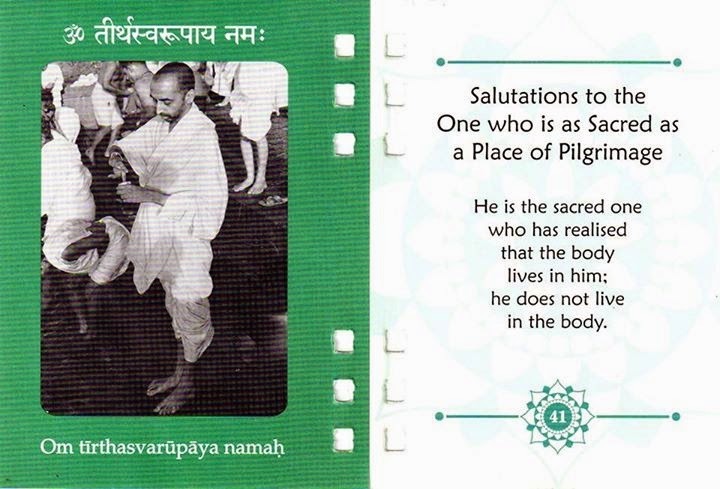 A special mention is here about ‘Parama padham’, “It is a state, where there is no rebirth”. Earlier In Vedic sciences this state is called as ‘Amaratvam’ ( No Death ). Later that has changed into ‘Ajam’ ( No Birth ). This change in expression shows the ‘the development in intelligence in that period of time’. A society in which the people are immature, fears about death. But when they attain mature mind, they begin to fear not death, but a rebirth. Why, because, it will be a restart to a new beginning to a life of sufferings. Death is for the one who takes birth, hence when it is said no death means no birth only. The Sanskrit word ‘Ajam’ indicates the progress in our mental maturity. 1. Service, 2. Nursing, 3. Divine/ True love, 4. Meditation, all are Upasanas. 2. Upasana what for/ why? : To uplift mind, to develop intelligence. 3. Moksham : Moha-Kshayam = defeat/decay of moham/desire. 4. Saguna Aradhana = very close to the Lord. Here Lord Krishna speaks of the merits one acquires who knows the true nature of His divine appearances as sac-cid-anandam or eternity, knowledge and bliss and also knows the divine nature of his lila's or phenomenal pastimes which he accomplishes by his internal potency without any touch of material nature. One who has realised the truth of His reality does not take rebirth again being freed from their gross physical body as well as their subtle body which is the cause of having to accept a gross body and having qualified themselves for liberation are eligible to come to the eternal spiritual realms of Lord Krishna which is the ultimate reality and revels in bliss with Him. Only by learning and comprehending the knowledge revealed in the Vedic scriptures is moksham or liberation possible. By knowing and furthermore correlating this knowledge from different Vedic texts and applying it to one's everyday life will the ultimate attainment be gained and no other way. It should be clearly understood that the mere knowledge of the facts and details of the Supreme Lords appearance and divine pastimes will not enable one to attain liberation from the material existence without having first applied this learning through the medium of the Vedic scriptures fully into one's life and all that one's life encompasses. Whosoever is able to verily realise the divine, spiritual and uniquely phenomenal nature of the Supreme Lord Krishna's incarnations and transcendental pastimes which are exclusively manifested for the benefit of all those who take refuge in Him solely and which are intended for the protection of the righteous who understand the real tattvam or truth concerning His appearances. 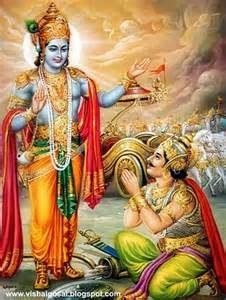 The word divyam in this verse meaning divine confirms that Lord Krishna appearance is not the same as the compulsory births of the conditioned embodied entities as a consequent reaction to their past life activities arising from their timeless interaction with prakriti or material nature. So in conclusion whoever understands that all avatars or incarnations emanate from Lord Krishna who is eternally possessed with all glorious qualities and wonderful attributes, such a person is not subject to rebirth once they leave their present body, but attains the eternal spiritual abode with the Supreme Lord. Put more succinctly such a person possessing accurate discriminative knowledge from discipline succession regarding Lord Krishna's incarnations and divine pastimes becomes free from all sins which stand in the way of coming to Him. Such a person in there present birth will attain Him by placing implicit reliance and full faith in Him in the manner described in previous verses and by making Him the be all and end all of their lives makes themselves extremely dear to the Lord which qualifies their existence for attaining Him. Next will be described the superb godly qualities of the these saintly persons.